OAK 311 has received this issue. Your service request ID is #896924. Please check back for status updates, or contact us directly at 510-615-5566. OAK 311 has received this issue. Your service request ID is #896837. Please check back for status updates, or contact us directly at 510-615-5566. OAK 311 has received this issue. Your service request ID is #896836. Please check back for status updates, or contact us directly at 510-615-5566. OAK 311 has received this issue. Your service request ID is #896838. Please check back for status updates, or contact us directly at 510-615-5566. OAK 311 has received this issue. Your service request ID is #896100. Please check back for status updates, or contact us directly at 510-615-5566. Thank you for your request. According to our system, we already have an open service request of this kind at this location. Your request has been combined with service request #895747. If you would like to check the status of the request, please contact OAK 311 at 510-615-5566 or OAK311@oaklandnet.com. This issue can also be followed by watching http://seeclickfix.com/issues/5709098. 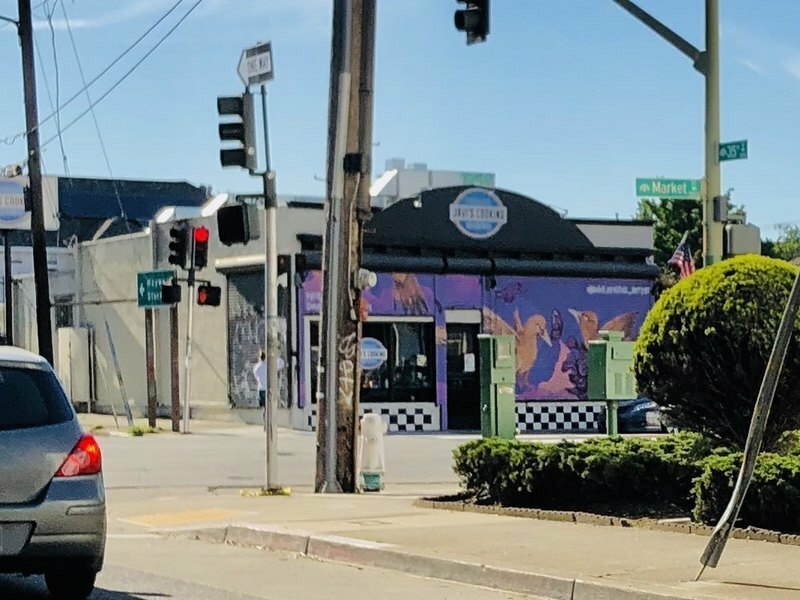 The City of Oakland addressed this issue on 04/19/2019, service request #895747. OAK 311 has received this issue. Your service request ID is #895747. Please check back for status updates, or contact us directly at 510-615-5566. OAK 311 has received this issue. Your service request ID is #897075. Please check back for status updates, or contact us directly at 510-615-5566. The City of Oakland Call Center has received this issue. Your service request ID is #766916. Please check back for status updates, or contact us directly at 510-615-5566. The previous business, Locol, is gone. Ravi’s Kitchen has replaced them and they appear to be trying to deal with the graffiti. 4/12/2019 photo. Javi’s Cooking, not Ravi’s Kitchen, sorry. OAK 311 has received this issue. Your service request ID is #896322. Please check back for status updates, or contact us directly at 510-615-5566. OAK 311 has received this issue. Your service request ID is #896672. Please check back for status updates, or contact us directly at 510-615-5566.